PamKittyMorning: Quiltmaker's 100 Blocks Blog Tour! Good morning!!! Welcome to the second day of the Quiltmaker's 100 Blocks Blog Tour! I'm excited to be included in this 9th issue of the magazine and my coffee is extra delicious today because of it! This issue, like all the others, has great instructions for each block. There is a designer's gallery that includes the quilts that will hang in the offices in Golden Colorado for those of us who can't make it to see them. There's a block tester's gallery for inspiration, full size templates, embroidery stitch instructions, quilting designs and even a give away! It's a great magazine. 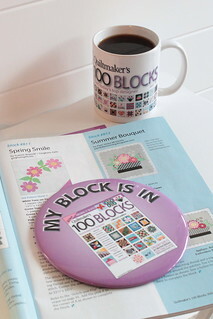 My block is #812 and is on page 31, Summer's Bouquet. I even had fun with a photoshopped version in Pam Kitty Garden. 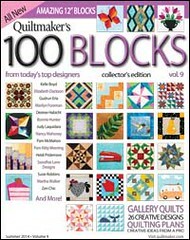 Quiltmaker is giving away a copy of the magazine to one of my lucky readers. Just leave a comment and I'll pick a winner on Friday! Now head over to the Quilty Pleasures Blog and check out all the other block designs on today's tour. Thanks again to Quiltmaker for including me in this great publication! I like both versions! Beautiful block! I like both but the second draws me closer. Soooo cute. The first version of your block is my favorite--that black check really zings! Congrats on such a cute block making the magazine! Your block is charming, and so PKM! I love a bit of black in my quilt blocks, and this one is heading for my Pinterest board asap! Such a lovely block and I love the black background! Juste cute! I love your block, as with everything you do, it just makes me smile. Your blog is such a happy place, it really starts my day off on the right foot. Thank you! Congratulations! Love the first version the best but both are cute! Love the block, perfect for this time of year! Congratulations on being in another issue of 100 Blocks! I love both blocks, but the Pam Kitty Garden wins out! Love the both, so cute! your block is adorable, Pam! love it! Cute block - thanks for sharing & thanks for the chance to win. My granddaughter would love the pink block. So cute! Oh that is such a pretty block! Summer Bouquet is beautiful! I see a wall hanging in my future. :) I like the first version better than the 2nd but I'm thinking my granddaughters would love that pink. Thanks for sharing! Cute, cute, cute! and so great for spring! A sweet, sweet block. Love the little flowers. It is so you! Beautiful blocks...would love to make them. Congratulations on your block going into the magazine! I appreciate the chance to win. I love both versions, the first looks elegant, and the second is so fun. OMG! What an adorable block! I absolutely think it's awesome. A much needed breathe of spring in the NE where we still are awaiting spring! You are so talented. I am totally in love with all your creativity.... I want to hitch a ride on your star so I can expand my own creativity.... Keep up the awesome work! I like both versions. What a lovely block. Thanks for a chance to win. I like the first one best, but both are very nice. Just love your little block! I've looked and looked (still looking for Vol.8)and no store around here seems to have the 100 Blocks Magazine. Guess our little hamlet doesn't carry it, will try to get to the city soon. Perfect for the spring to summer table! I love your flower block. Prefer the one with the black and white check basket as I think it shows off your design better. What a great block! I love the colors you chose. Thanks! I love your block - it is so cheerful! Thanks! I like the first block. The black and white gives it a pop. I also like the softness of the second block. Thank you. Aww, it's so cute!! Congrats and thanks! what fun, I love your block!!!! Cute block - cute kitties! Such a pretty block. Both versions are lovely but I do prefer the second one in your own fabrics. I'm looking forward to recreating it for myself! Thank you for the opportunity. Adorable. Especially like the first one. All those flower shapes look like a window planter I would want. Variety is great! Adorable block! Thanks for the chance to win. Love your blog and visit often. What pretty and Spring-y blocks! I like the first one best (the gingham makes those flowers POP)! congrats, this is such a pretty and spring time block. I love the fabrics you chose. Thanks for a chance to win the magazine. What a fun block. I used to hate the "A" word, but lately applique has been my most favorite... well, next to machine quilting that is. Thanks so much for sharing with us. Congrats on getting your block and quilt into the publication. Thank you for hosting the giveaway. Such a cute block! I like the first version best, but they are both pretty cool. Thank you for offering the giveaway, Pam. Congrats on your wonderful block! Thanks for a chance to win a copy of the magazine. Love your block and I was just thinking about making a little quilt for my sisters new garden room, this would be perfect. I like the first version of your quilt, because the elements of the block are more readily visible. love love your block. the border is so such a sweet addition. Congrats! 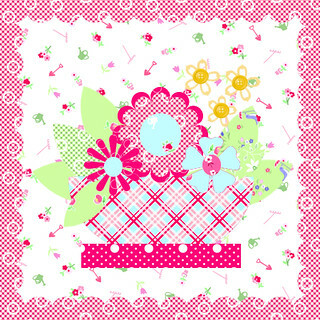 Love your little block especially the border, very "springy"
Such a lovely block! Makes me smile! So Cute! I could see this used in so many ways. Congrats! LOVE these issues when they come out. thnx for the giveaway! I love YOUR version with the black gingham basket!! Such a HAPPY block!! I bet that coffee WAS extra yummy this morning in that special quilty mug! Great block and thx for chance to win giveaway! I love the magazine and use them often when doing block of the month challenges. I'm fortunate to live near Golden and have been to their offices! Gorgeous block. Nothing I like more than a good applique block. This would be perfect for spring! I like your first version of the basket of flowers block. Great block! I like the pink version best. Love the block! It is so you. What a lovely update on the traditional flower basket block. I like it very much. Cute, cute Cute as always! A very pretty block. Flower baskets are always nice. Ooo! Ooo! I have all the fabrics to make the first version. I love this block! You are so bright and cherry, how could your block be anything else? Love it. Thanks for the giveaway. How cute. Makes me think of spring and Valentines. Thank you so much for sharing. Such happy flowers in your block! I love it! The second one's bright colors and movement is my favorite. What is not to love about that sweet basket. It is very charming. Fun block! The flowers caught my eye first - Happy and cheerful. The first version is my favorite. I think I like the first version better. I love to applique. Thanks for the chance to win. The first block really got my attention. Good job! I just love how switching the colors/fabrics gives the block a whole different feel! Beautiful block.....I love it in both colour ways! And I am so excited about Pam Kitty Garden! Love your not so sneak peek at Pam Kitty Garden! congratulations on getting the block into the book. I like them both. Really great block! Thanks for doing this giveaway! Spring Bouquet is a delightful block. Sweet block with a great vintage vibe! I see sweet '30's fabrics, a girl bed quilt and kitchen! Congrats on being published in Vol. 9 and thank you for the giveaway. Summer Bouquets are just what we need after this long winter. Thanks for cheering me up. Wonderful flower basket. Thank you. Great block--love all the flowers! Very cute block. I haven't used applique yet. I like the vibrant colors of the second version. This is a fun blog tour, thanks for putting my name in the drawing. Cute little Bouquet Block. Thanks for sharing it with all of us through Quiltmaker. Hope you Pick ME to win a copy of this Magazine. What a sweet block. thanks for the chance to win. I would love to win this magazine. Thanks. Such a cute block in your fabric line. Just screams spring, which is so needed after this long cold winter. I love both versions of the block but, I love just about everything you come up with. Congratulations! I really love your Summer's Bouquet block....I will definitely be making this one! Thank you for sharing! Very nice block! I love the bright flowers with the black and white check! I love the block. I love all the wonderful things you create. Congrats on being in the magazine. Thanks for a wonderful giveaway. Congratulations on having it in the book. Love your block it is so cute. Love your happy little block! Congratulations on having your block selected. I like both versions and would like to try both of them. Thanks for the great giveaway. Your blocks are always so distinctly "YOU"! Adorable! Summer's Bouquet is an adorable block! Congratulations for having your block chosen for Issue No. 9. Love your block! It is perfect for a Spring project! I love the one with the black and white checks. It's a very cute block that can stand alone as a wall hanging or the side of a tote bag. Thanks for the give away! I just love the plaid basket! Thanks for the opportunity to win. Love your block, thanks for the chance! Love your happy little block! I love embroidered flowers and baskets, maybe I will have to try appliqued ones now. Thanks! What a lovely block! Thanks for the great giveaway. Congratulations on your block being published. Love the block. Thanks for the chance to win. And a timely block it is! The wildflowers have been blooming like crazy in South Texas! Adorable block!!! Love the scalloped edge framing it too!!! Congratulations on being in this fabulous issue!! Love the block! I appreciate applique very much but don't enjoy the time it takes to complete. Fabulous block! Congratulations on being chosen for Vol. 9. Congrats on being in the book! I'd love to win. Love your block, too. Your block is AWESOME! Thanks for the chance to win the magazine, love the 100 Block issues. Oh what a lovely "Summer's Bouquet" You have a lovely web site. I like Pam Kitty Love!! Sooo cute...a handful of blocks would make a great wall hanging. I love that your block feels like spring! Been a fan of your fabrics and designs for awhile, keep up all the great inspirations! It's nice to have a basket of flowers after a cold winter. Plus it's my birthday this Saturday, so it's even better. I love the pattern! Your creativity continues to blow me away! Both are nice, but I like the first. Thank you for sharing. Happy, happy, happy! That's what your block says to me! Great vibes and thanks so much for the giveaway. Love the block with the black check background! Really shows off the flowers. I am in love with your pretty block! Congratulations! Your block is precious! It looks beautiful! I love both versions. PKM love your blog and designs. Your block is so cute...thank you for the chance to win. I love both your blocks! What fun to have a flower block, and I might even consider doing this with some wool for a little wall hanging. 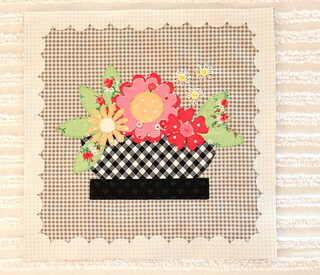 Fun block - love flowers and gingham!! Cute block! Congratulations on being in the magazine. Thanks for the chance to win a copy. I like the first one. Thanks for yhe chance to win. What a cheerful array of flowers. Inspirational! What a fun looking block. congrats on getting your block published. I can hardly wait to get an issue to see all of the beautiful inspiration. Hi!!!! Beautiful block!!!! I love both of them!!!! I LOVE both!!!!!! Great job! Love the block with the black gingham bowl. Too cute! Congrats on having a block in the book, too! Love your flower basket. It was a fairly nice day today, but the rest of the week is supposed to be rainy and cold. I haven't seen a single one of my tulips coming up yet. That's such a pretty block! Thanks for a chance at the give-away! Perfect for a little girl quilt! Like the photshopped pink one. Cute block. Congrats for making the issue. Cute block. And the gingham is perfect for the design. Lovely block - bright and fun, like your fabrics! Congratulations on getting your block published!! I have only been quilting for about 3 years and would love to get the magazine for ideas. Thank you for the giveaway!! I have made a couple of quilts done using your block idea. I usually find a card I really like and then make it into a quilt. What a darling block! Love the black checked background. It's a very springtime looking block. What a cheerful happy block Pam! Thanks for the chance to win a copy of Vol.9. I like both versions, but especially the first. Cute! Cute! Cute! Great block. What a pretty little block. I love the variety of blocks on the blog hop so far! A very pretty block that could be used in a number of projects. Congrats on your block! It is so pretty :) One of my favorites, so far!